Airlines are always obsessing over fuel costs. It’s a crucial aspect of their business, after all, and accounts for 1/3 of their operating expenses. So you might think that all the major airlines do roughly the same things to minimize their fuel use. But that doesn’t seem to be true. The Washington Post (Sept. 21, 2013) reports that there’s actually a surprising amount of variation in how airlines burn fuel. 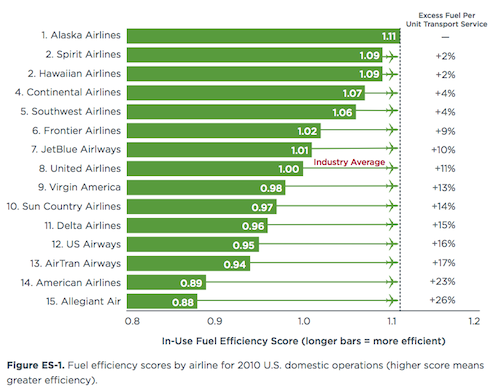 It ranked the 15 biggest U.S. airlines by fuel efficiency and found very large disparities, as seen in the attached graph. The least efficient airline, Allegiant Air — a low-cost carrier that targets smaller airports — used 26% more fuel than the most efficient, Alaska Airlines, to achieve a similar level of transport. – Differences in technology: About 1/3 of the variation likely comes from the fact that different airlines use different technology — they don’t all deploy the most advanced, efficient aircraft. Allegiant, for instance, has a fleet of McDonnell Douglas aircraft that dates back to the 1970s. Alaska Airlines, by contrast, uses newer Boeing planes that have technologies like “winglets” to reduce fuel burn. – Differences in operations: Technology can’t explain all the disparity in fuel efficiency. Some airlines, like Southwest, manage to operate older aircraft quite efficiently. Other airlines, like Virgin, have newer aircraft but are relatively inefficient. – High oil prices don’t necessarily drive fuel savings. The most efficient airlines aren’t necessarily the most profitable. Allegiant was the least-efficient airline in 2010 but also the most profitable. That’s because it tends to serve airports that other airlines neglect, giving it more leverage to raise prices on routes.